Not everybody has the luxury of a large kitchen. It’s how you make the most of the available space that counts. 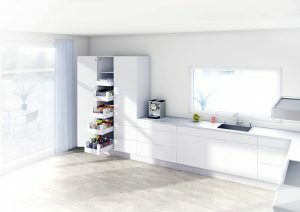 We’ll provide you with perfectly-planned and designed cupboards to fit your requirements exactly. Or view our cabinet components for a variety of top opening doors, soft close drawers and more ! 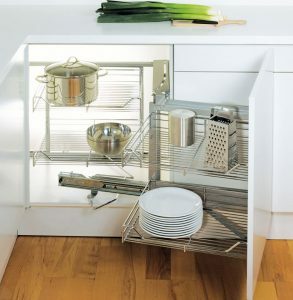 Tall larder units with integrated drawers provide easy access and ample storage space. It can be tailored to your needs to suit your personal buying and cooking habits. The cabinet comes in various widths, heights and even depths. It all depends on your storage space needs. 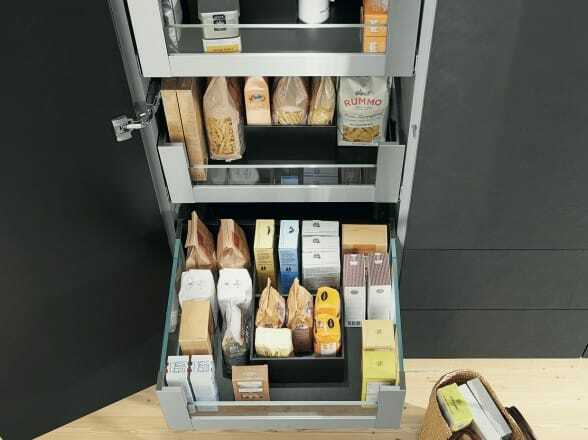 Fully extending drawers can be opened individually, making the contents quickly and easily accessible from all three sides. The simple solution that helps you make the best use of space in corner units. Just swing the front panel and the front shelves to one side and the back shelves automatically slide forwards. It’s Ideal for storing tableware and groceries and give you access to the full contents of your units. The integrated soft-closing mechanism comes as standard and all shelves can easily be removed for cleaning and clipped back into place. With fully extendable drawers, this dramatic corner cabinet solution puts wasted corners to good use. The spacious drawers give you easy, ergonomic access to provisions.